Siddhpur is a holy pilgrimage place at the bank of river Sarswati in North Gujarat, where Sage Kapil (Muni) imparted the knowledge of ‘Sankhya Yoga’ to His Divine Mother Devhuti, as per Bhagwat Purana. Pujya Swami Adhyatmanandji Maharaj was invited to conduct spiritual retreat in Siddhpur. 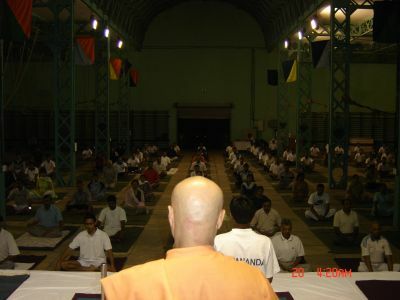 A three-day spiritual retreat was concluded on Oct 1, 2005. Also October 1, 2005 was marked by a historical event in Siddhpur. A big project taken up by Government of Gujarat of linking the over flowing river Narmada to dry bed of river Sarswati to enrich the land of this area. Chief Minister of Gujarat Sri. Narendrabhai Modi made his august presence at this important event. Also Pujya Swami Adhyatmanandji with many other saints and sages witnessed and graced the events. Nation celebrated Pujya Bapuji Mahatma Gandhiji’s birth anniversary day on Oct 2, 2005. At well known Sabarmati Ashram, Ahmedabad all religion prayer was lead by Sri Swami Adhyatmanandaji which was attended by H. E. Governor of Gujarat Shri Naval Kishore Sharmaji, Shri Shankar Singh Waghela, Minister of Textiles, Government of India. Most worshipful & revered Sri. Morari Bapu also graced this occasion. Navaratri is traditionally an auspicious time, a period of introspection and purification. 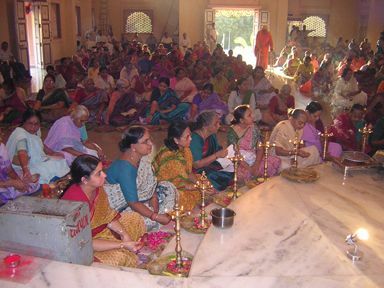 It was an intense Sadhana time at the ashram during nine days of Navaratri and Devi worship. Each day, early morning commenced with prayer and meditation then followed chanting of all eighteen chapters of Bhagavad Gita by devotees. In the afternoon, after mid-day meditation group recitation of “Sri. Durga Saptashati” was truly enriching and uplifting for all. Durga Saptashati is Devi Mmahatmaya of seven hundred Mantras, considered very potent. It forms a part of the Markandeya Purana, one of the 18 important puranas of Hinduism. 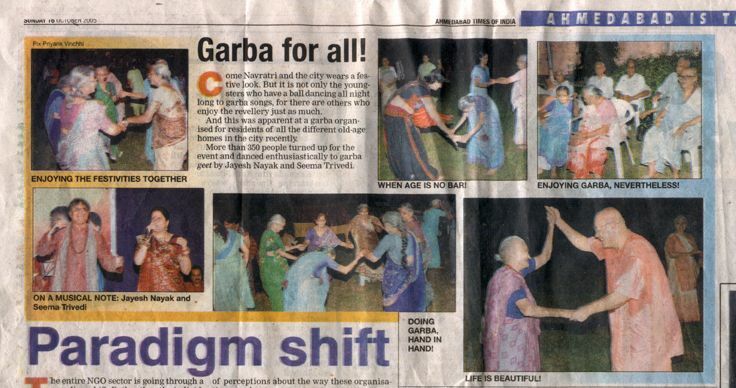 At dusk, after japa and meditation, nights were rejoiced with traditional garba and dandia-ras in the praise of Mother Durga. On first & second day of Navaratri Senior citizens were invited and arrangements were made to bring them from Senior Citizen homes of the city. A special orchestra and singing directed by Mrs. Seema Trivedi and Mr. Jayesh Naik. 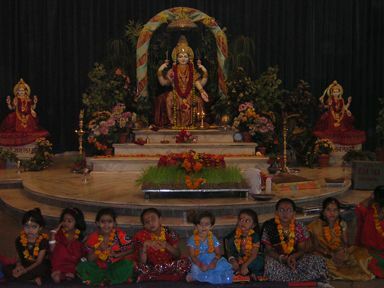 On fourth Navaratri day devotees joined in the group worship at Shri Ashta Laxmi Bhavan. It was a divine site to have darshan of Maa Ashtalaxmi adorned in a Grand Shringar. 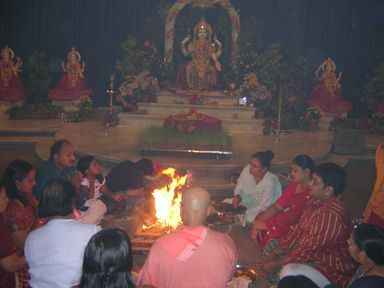 A special “Havan- Yajna” on ashtami day and Kumarika Poojan on ninth day were performed at Shri.Ashta Laxmi Bhavan. On Vijayadasami day a distinguished choreographer and founder director of Mudra School of Indian Classical dance Mr. Bhaskar Menon & his family celebrated his diamond jubilee 60th birthday at Sivananda Ashram, Ahmedabad and received Pujya Swamiji’s Blessings. Early morning initially plantation of trees was done and followed by “Ayushya homam” and late in the evening Mr. Bhaskar Menon and Mrs.Radha Menon and their son and daughter Mr. Anant Menon and Mrs.Aparna Kiran performed ‘Kichaka Vadham’, an episode from epic Mahabharat in Katha Kali style with traditional costumes and with music of Kerala. This followed with another style of Indian classical dance from Andhra Pradesh as Kuchi Pudi with the befitting theme on the occasion ‘Mahisasur Mardani’. A dinner was served to all who attended this event. Upon the humble request by General Arun Chopra AVSM Commandant of National Defense Academy, Sri Swami Adhyatmanandaji Maharaj conducted ten days yoga camp at Khadakwasla, Pune. Yoga instructors Dr.Snehal Amin, Ms. Sangeeta Thawani and Yogi Ankur also joined Swamiji. General Arun Chopra welcomed Swamiji & his team on arrival at NDA. All ranks officers with their families including Deputy Commandant and Commandant Mr. Arun Chopra were present at inaugural ceremony at Habib Ullah Hall, Three yogasan classes were conducted in gymnasium everyday. Swamiji gave series of discourses and shared the theme of ‘Gita for Soldiers’. In which Swamiji emphasized that Bhagwad Gita teaches, Dharma is to be loyal to one’s duty. Devotion to the Mother India and its prestige is our first and foremost duty or religion. He praised Soldiers for their dedication and service to the Nation. Inter Battalion cultural festival was organized at famous Habib Ullah hall of NDA. Rev. Swami Adhyatmanandaji Maharaj in his address invoked his grace to the large gatherings of army officials and their respected families that unity in the diversity is the secret of Mother India. Cultural Heritage of mother India is truth, character, purity and modesty in all conducts. Struggle for perfection is the highest task of our life. 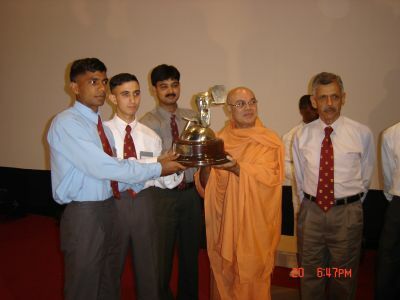 Swamiji greeted them and awarded the prizes for their individual and group performance. During his stay Swamiji was given tour to the National Defense academy. 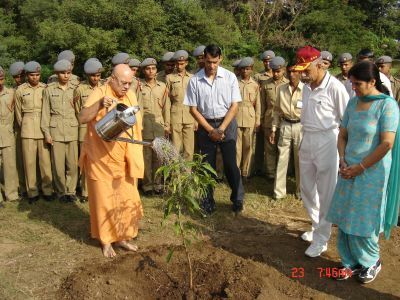 A very systematic plantation of mangoes, singapori coconut plants and custard apple trees were planted by hundreds of army officials and their family members to make a goodwill gesture towards Sri Swamiji. On Sunday’s evening Swamiji paid his homage to Most Worshipful and Revered His Holiness Sadhu Vasvaniji at his Institute. Revered Dada J. P. Vasvaniji welcomed Rev. Swamiji with warmth and love. They had a great satsang together. Revered Dada Ji blessed all the people who went with Swamiji from NDA Khadakwasla. Yogi Ankur demonstrated a few difficult yoga postures namely Omkarasana, Dand Sirshasana, Padma Sirshasana and many more... All commended his yoga skill. On their way to Ahmedabad, Swamiji and his team paid their homage to Sri Sri Sai Baba at Shirdi (Maharashtra). It is a festival of light, joy & illumination. Traditionally it is celebrated in a very special way at Sivananda Ashram, Ahmedabad. People are in joyful and festive mood come for darshan, prayers and to seek Lord’s blessings for upcoming New-Year. On Dhanteras day (Laxmi Trayodhasi), a grand Laxmi Poojan is being organized where large numbers of devotees together performs puja at Sri Sri Ashta Laxmi Bhavan. A Grand Annakoot, over a few hundred different food dishes prepared by devotees are offered to holy shrine of Sri Maa Ashta Laxmi. And at the night of Deepavali day thousands of devotees come to rejoice this Annakoot darshan at the Ashram. The next day all the sweets and dry foods gets packed in gift-wrap and get distributed to less privileged people in the city on a New Year day. That is a real happy New Year for all. This month, large numbers of guests and visitors came and rejoiced the grace of Mother Durga during Navratri and Mother Laxmi during Deepavali. Yoga classes were conducted as always by Dr.Snehal Amin, Mr. Snehal Bhatia, Mrs. Surekha Sonar, Mrs. Dharmishtha Patel, Miss. Sangeeta Thawani, Sri.Minesh Valand, Mrs.Shailey Trivedi, Mrs.Janki Shah, Mrs.Yojana Tandon, Mrs.Bhavna Naidu, Miss. Dhara Upadhyaya and Miss Sonal Trivedi. Monthly grocery is provided to the Senior Citizens and underprivileged people as usual. Dr.Snehal Amin gave his yoga consultation to the needy patients on every Wednesday and Friday evenings. Other than the daily satsangs at night from 9 to 9:45 pm special satsangs were conducted on Sunday from 9.00am to 12.00 pm. Mrutyunjaya Mantra japa on every Sunday from morning 7:00 am to 5:00pm in the evening and the chanting of Sunderkand from Ramcharit Manas on every Saturday evening at Hanuman Temple at Sivananda Ashram. On Oct 2, 2005, evening Swamiji Maharaj presided over Silver Jubilee celebration of Physical handicap people’s organization at Bhavnagar. National Security Service (NSS), project of Government of India organized a weeklong Man making program for Youth. On Oct 3 2005, Rev. Swamiji addressed to Youth assembly, talked about mental hygiene and to make a solid foundation with sound character. He further stressed the importance of developing virtues & eradicates vices. Hundreds of trees were planted by youth and pledge was made to follow good codes of conduct. On Oct 26, 2005 on his way back from Shirdi to Ahmedabad, Swamiji went to Navasari and attended the function of re-opening of the Rotary Eye Hospital and its dedication for the general public service.